First of all, you have to find a tone of voice that suits your brand and reflects how you want your brand to be seen. What’s your brand’s personality and values? Think about what your brand stands for – and adapt your copy accordingly. LUSH for instance, use bold statements to promote their cause of animal welfare, whilst Innocent uses its friendly tone of voice and humour to show the honest and helpful personality of the brand. These brand are doing a great job because they clearly communicate their passion for their work, which shows their authenticity. Whether it’s humour, expertise or bold statements – find something that suits your brand and stick to it. Simplicity is key when it comes to copywriting. No one wants to read long, complicated blocks of text. Keep it short and simple – without being boring. This might take a bit of practice but once you’ve figured it out, it will really help keep your audience engaged. Innocent sometimes don’t even write full sentences – and whilst the grammar police would kick off, it clearly works for their audience. 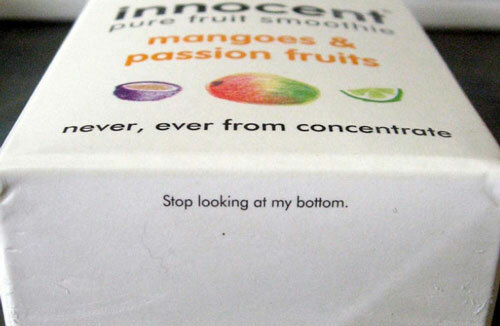 Whether it’s on their product packaging or their website – Innocent’s copy always tells a story. Brand storytelling is extremely important in order to engage and excite your audience about the brand. Brand storytelling is a powerful tool: it fuels people’s imagination! Whether it’s a wordplay, a cheeky sentence at the bottom of your packaging or a bold statement to grab people’s attention – be clever with your copy and create something you want to be remembered for. Customers are exposed to thousands of marketing messages every day, so be sure to make your message stand out in the crowd. If you need any help with your marketing or copywriting, contact CuCo today on 01202 911959 or email us at hello@cucocreative.co.uk – We’d love to help! Thank you very much for your recommendations, they are useful. Before you write a text that will describe your brand, it is necessary to create a map of delirium. You need to understand for whom you work, what values you share, what is important for your brand and team, what clients you are looking for and for whom you work. As for me, these are very important components, without which you are unlikely to write a good text about your brand. It also seems to me that your company’s description is best written as a story, it is most easily perceived. And all that is better perceived by your customers, works better, leaves an impression.